My family is intensely competitive, especially my two brothers and our mother. A few times a year, we all get together in Milwaukee (both my mom and brother Mike’s family live there) to spend time together. One thing leads to another, we find a babysitter for my nephews, and we head to a bar called Skippy’s to play some pool. 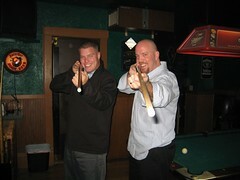 Thankfully, my brother Dave (pictured) and I beat the piss out of the other two…crowning us 2005 family champs!